The unofficial semi-sequel to Dazed and Confused, this movie is a lot of fun and manages to do it all without any conflict. A pretty cool movie, this one, like Dazed and Confused, is about the friends, the music, the atmosphere, and the experience. What it’s not about is story. There’s very little conflict here, and the movie easily gets by without it. Chalk that up to these characters being so much fun to be around, and to travel from place to place with. These are playful guys who make fun of each other every chance they can get, but never in a way that is anything more than joking around. They also have each others backs, even when they don’t necessarily agree with what one of their brothers is doing. Watching these guys switch outfits to fit into different environments, and try to blend in wherever they go, turns out to be a lot of fun. Everybody Wants Something is an enjoyable film. It’s one of those movies that is about the time and the experience, more than it is about the story. In fact, there really isn’t a whole lot of story there at all. Not even short stories. This is simply about the characters and the fun times they have. It’s about the mentality of being at college during the late seventies, and being on the baseball team. This is a movie about guys hanging out. And to the films credit, it really does put you, the viewer, right there into the middle of the experience. 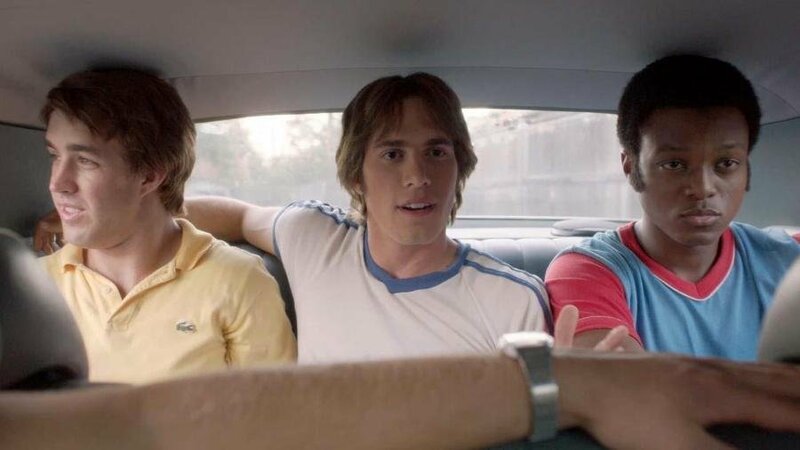 They say this film is the unofficial sequel to Dazed and Confused, being by the same writer-director, Richard Linklater, and sure there are plenty of similarities, such as music, atmosphere, and ensemble piece, but other than those basics, the movies are actually pretty different. You see, Dazed and Confused did have story. There was the story of the boy Mitch, who was caught between his freshman friends and the older guys who sort of adopted him and wanted him to join their group. There was the story of the party that some guys were throwing and how their parents, who were going out of town, caught wind of it. There was the story of the contract that the football players were being asked to sign. Everybody Wants Some really doesn’t have that sort of thing going on. There is only one small story in the film, and it is the story of the main character, Jake (Blake Jenner,) and the girl he is chasing after. It’s a brief story that barely even starts appearing until the second half of the film. While the movie doesn’t have much in the ways of storytelling, it certainly puts the effort in to giving us character. In fact, the film features one main character, Jake, and really makes his experience of coming to this school into its primary focus. At the start of the film, we come in on an overhead shot of the parking lot and a car riding around it, looking for a spot. This plays with the song, My Cheona, popular music of the time. All of this is very much the same way that Dazed and Confused began with an Aerosmith song and overhead, parking lot, car driving around shots. This movie certainly wants audiences to make the connections between the films. I’m actually surprised that not a single character from that movie appears in any way in this one, playing an older version of his chracter from the previous film. From the parking lot, we follow Jake as he parks his car and heads into the house. He goes from floor to floor meeting each of his teammates and housemates. This tracking shot sort of technique is pretty cool, because it puts us into Jake’s shoes and also helps us to get to know everyone ourselves. None of the meetings is especially memorable, but all of them have the same kind of vibe and feeling. These are guys who are friendly, but also like to bust each others balls. They mess with each other every chance they can get, not in a mean way, but in a funny, you have to be able to take a joke and realize that people are just kidding around, kind of way. The boys have a nickname for Jake’s roomate, for example. They all call him Beuter. He doesn’t accept it, instead chooses to show sensitivity, and so he ends up having a hard time being taken seriously by the rest of the group. From the floor to floor house meeting scene, Jake is quickly invited out with the guys to a local bar for happy hour. After getting a few pitchers, the boys drive around campus to check out some of the local females moving in. They pull up beside any hot girls they see and try to invite these girls to a party. In the case of two girls, who are showing them very little attention, one of the girls ducks down to look into the car. She spots Jake, sitting quietly in the backseat, right in the middle of two other guys, and makes a comment about how he’ s her favorite because he’s so quiet. Jake isn’t sure if she’s saying this just to mess with the other guys, or because she actually means it, so he decides to find out more. This starts with him convincing the guys to drive up to the dorm building as she is walking in, so he can see what room number she is in. The boys go out to a disco that night, and then bring the party back to their place. There was a meeting earlier on, in the afternoon, where the coach of the baseball team laid down the rules of the house they are living in. The rules were pretty simple. No booze and no girls upstairs. When the boys end up bringing girls back from the disco, both rules get broken pretty quickly. Only Jake’s got a problem. His roommate, Beuter, won’t leave the room. Jake tries to explain how Beauter will be doing him a favor, only his roommate just won’t budge. This is quite possibly the only area of tension in the movie, and lasts for just one quick scene. Other than that, there’s a close call with a disco fight, and that’s pretty much it. And with the disco fight, our protagonist, Jake, isn’t really involved. It’s another guy who looks like a weirdo, complete with handle bar muchtache, and gets into something with the bartender over his drink. The bartender ends up jumping over the counter and attacking the guy, and the next thing you know, this guys is being forced out of the club and into the street. And all of his friends on the team decide to go with him. They might not like or condone what he is doing, but they still support him as a member of their group. At least enough to leave that place and show that they are all in this together . Of course, no sooner do they leave and decide to go somewhere else, then do they tell the guy he needs to sit this one out, considering he’s the reason they all just had to leave the other pace. One thing that’s a lot of fun about this movie is the way the guys are so easy going about every new place they check out, open and willing to give anything a try. They change outfits based on where they are going as if they are actors backstage in a play. So when the boys go to a disco, they where long sleeve silk shirts. When they decide to check out a country bar, they have to go home and change first into something that would be more fitting for the new environment. Later on in the film, they go to an artsy party and the boys quickly pick up items and props that will help them fit in, whether it’s a strange hat or a necklace, or anything else that they can make work. There’s no animosity here, and that goes a long way. There is no racism toward the one black kid on the team, and I don’t just mean among the other team members. There’s no racism anywhere they go, including the country music club. People are here to have a good time, and nothing else. When they go to the artsy party, none of these guys look down on the guys throwing the party and give them a hard time. Another movie might look at it like the jocks on the team and the nerds being the ones throwing the party, but this movie shows that everyone is there to have a good time. They all want to just fit in, and that’s what the outfit changes are all about. In the case of the art party, only Jake has really been invited, but these guys stay together, and where one of them goes, the rest of them go as well. Still, the last thing any of them would want to do is embarrass Jake at this place. For a movie about guys on a baseball team, the film really takes its time before giving us any scenes on the baseball field. That’s all intentional, of course. This is not a sports film, and instead, there is a very different agenda at play here. When we finally do get a baseball scene, it’s a treat. We see the best pitcher facing off against the best batter, (the guy who split a baseball with an axe just for fun.) It’s a testament to this film that it can hold off on showing us any baseball for so long and still be entertaining, considering that’ the reason why all these characters are together, in the same house. There’s a lot to like about this movie. The only downside is the lack of conflict. Every once in a while there’s a little snippet of something in the air, be it a guy who might have gotten his girlfriend pregnant, or another guy who has to leave the group, but all of this is like background noise. The guys care about the problems of their friends, but not enough to let it get them down or ruin their fun. While the movie is definitely enjoyable, the absense of any tension or conflict is the reason why we never end up on the edge of our seats, glued to the screen. I suppose this movie really is like Dazed and Confused in that kind of way. It’s more about just hanging out and being young than it is about storytelling. For what the film sets out to do, presenting a picture of this atmosphere and environment as if its an experience that we can all be apart of, at least so long as the movie is on the screen, it works. This is a different kind of film, and it’s worth the ride.